Eastworks is a 500,000-square-foot converted mill building in the heart of Easthampton housing celebrated artists, creative entrepreneurs, local and national businesses, event spaces, a restaurant and residents. We offer four floors of commercial, office, artist and warehouse space along with 46 live/work lofts on our top floor. 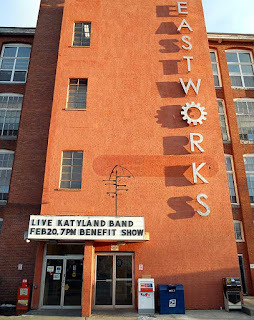 Eastworks is renowned for supporting viable and strong businesses, incubating innovators, and sparking public discourse at our community events. Our mission is to actively create and bolster the collaborative community in our City and beyond. At Eastworks, every studio has a story. Every window sheds light on someone brushing paint on canvas, or running a small business, or holding a community meeting, or making a cup of coffee. Every door leads to someone who calls us home. Most importantly, Eastworks is a gathering place. We say it’s “where community happens” because Eastworks is a conduit for engagement and interaction. We don’t have tenants; we have neighbors who are invested in our community. We’re intentional about building community—from housing curated art shows to offering sought after spaces for live performances, speakers and events. We also know that in a building that imitates city blocks, community is inevitable. You might collaborate with the person down the hall, use one of the many services on our first floor, eat dinner with your family, and say hello to your neighbors. It’s exactly how we envisioned it when we bought the building in 1997. At Eastworks, we’re all working separately and together to shape our community and our world.